Oshkosh Corporation announced today its Extreme Racing team has completed the 43rd Annual Tecate SCORE Baja 1000 off-road race course in Mexico. 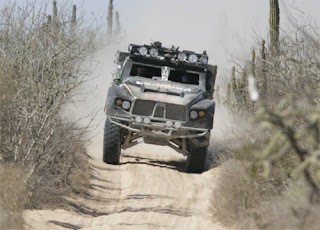 The Oshkosh Extreme Racing team ran its Light Concept Vehicles (LCV) through the rugged 1,061-mile desert course and one crossed the finish line in La Paz today. The two Oshkosh Extreme Racing vehicles, numbered M1 and M2 for the race, were driven by members of California Gold Racing (CGR), led by legendary race driver Glenn Harris. M2 reached speeds of nearly 80 miles per hour and completed the course at 4:20 p.m. PST – approximately 6.5 hours over the limit for scoring purposes. Oshkosh Extreme Racing ran two vehicles in the 1,061-mile off-road race. The Oshkosh LCV M1 was unable to meet a checkpoint time requirement, causing the vehicle to receive a “did not finish” result. The LCV includes the next-generation of TAK-4® independent suspension systems. The new system expands on Oshkosh’s patented TAK-4 suspension by increasing off-road mobility, improving vehicle maneuverability and providing a smoother ride. The Oshkosh ProPulse® diesel-electric powertrain design delivers improved fuel economy and can export significant levels of electrical power.